(prayer books) they hold. Kehillat Bnei Torah Synagogue is a bloodbath. Even as I desparately wonder and wish I knew, I see another arm before me. Also wrapped in tefillin. Also in Jerusalem. My son’s. The morning of his bar mitzvah this past summer. In the middle of a war. (Western Wall) before him. 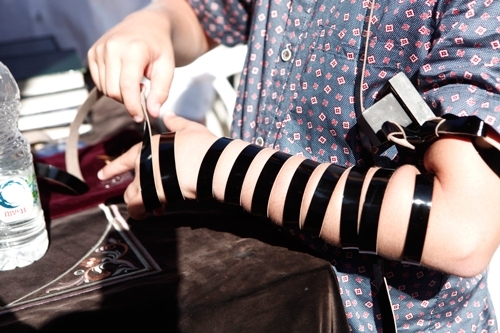 Slowly, deliberately, he wrapped his new tefillin around his young arm, curled them around his still-growing hand. He flexed his fingers awkwardly as he tried to find a comfortable way to prevent the leather straps from unfurling. With his pristine tallit swaying from his shoulders, he grabbed a siddur–they are on every surface at the Kotel–and prayed the morning service. And then he read from the Torah. We yelled Mazel Tov, and sang, and clapped. A day of celebration. And prayer. I bring these two eerily similar images side by side. One so horrifying. So quiet. Colorless except for the black of the tefillin and the deep red stains. The other filled with light and life. With joy. And hope. It’s difficult to see. The two images together. Chilling. The hairs on my arms stand straight up. My son, with his whole life ahead of him on the one side. And whose son, whose life cut senselessly short, on the other? I don’t know whose arm it is. Maybe I never will. But these two images are a powerful juxtaposition of death and life. Of horror and hope. Yesterday was one of deep despair, of paralyzing fear, of anger and outrage. Like all the hundreds of days of attacks that have passed before. And like all the many that are sure to come. Will it ever end? It feels impossible to imagine. And yet, we must! We are a people of faith. The song of our nation, of our people, is called “Hatikvah,” The Hope. The images are horrible, difficult to see, all of them. But this is the one that sticks with me. Because when I look at it, I see my son’s youthful arm similarly swathed in tefillin in that same beloved and holy city. Jerusalem. Please. Let us not forget the Hope. Rabbi Aryeh Kupinsky, Rabbi Avraham Shmuel Goldberg, Rabbi Calman Levine, Rabbi Moshe Twersky, police officer Zidan Saif. Baruch dayan haemet. May their memory be a blessing.